Paycentive reaches millions of bank customers and generates long lasting and profitable customer relationships. Paycentive provides a digital and performance-based loyalty-marketing tool to regional merchants and national brands alike. Bank customers get rewards for shopping at participating merchants. 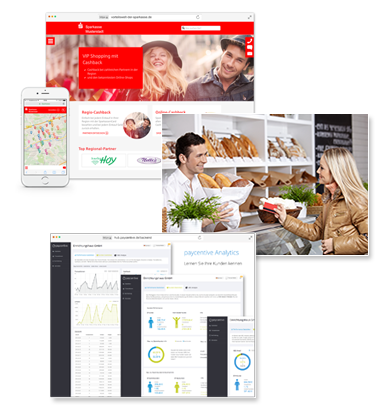 Merchants address attractive target groups, increase customer retention and boost turnover. Interested? Please don´t hesitate to get in touch with us. We are pleased to send you more informations about paycentive and its benefits for your business. Just send us the form and we will get back to you.